Only the One, without a second. the self-luminous inner light of the Self is ever shining steadily in the chamber of your heart. God is the Light of Heaven and Earth, affirms the Quran (Sura 24:35), signifying, God is the Real Illuminator of both the Inner Unmanifest and the Outer Manifest Realms. The Torah says, within our world of illusions and darkness, only in God’s light do we see light (Psalm 36:9). The New Testament testifies, God is the light of the world, whoever follows will never walk in darkness, but will have the light of life (John 8:12). Sit quietly. Close your eyes. Withdraw the senses. 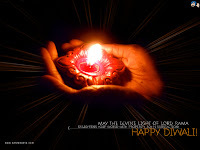 Fix the mind on this Supreme Light and enjoy the real Diwali, by attaining illumination of the soul. He who Himself sees all but whom no one beholds, Who illumines the intellect, the sun, the moon and the stars and the whole universe but whom they cannot illumine, He indeed is Brahman, He is the inner Self. Celebrate the real Deepavali by living in Brahman, and enjoy the eternal bliss of the soul. The sun does not shine there, nor do the moon and the stars, nor do lightnings shine and much less fire. All the lights of the world cannot be compared even to a ray of the inner light of the Self. Merge yourself in this light of lights and enjoy the supreme Deepavali. Many Deepavali festivals have come and gone. Yet the hearts of the vast majority are as dark as the night of no moon. The house is lit with lamps, but the heart is full of the darkness of ignorance. O man! Wake up from the slumber of ignorance. Realise the constant and eternal light of the Soul, which neither rises nor sets, through meditation and deep enquiry.